It will probably come as no surprise to discover that such an iconic figure as Nessie the Loch Ness monster (LNM) has been celebrated and immortalised by music down through the decades since her modern-day media debut during the early 1930s, but what may be surprising is the wide range of genres that have done so - from foxtrots and folk to heavy metal, skinhead reggae, and cartoon classics. So here is an annotated listing of some famous and not-so-famous musical tributes to the world's favourite monster, whatever your tuneful tastes may be, and accompanied wherever possible with links to their performances on YouTube. And where better to begin than with some wonderful recordings inspired by and released during that fateful 1933-1934 period of LNM-related frenzy, a period that witnessed the reporting of some classic Nessie sightings following the opening in 1933 of a new motoring road, the A82, directly overlooking the northern shoreline of this hitherto-secluded loch – a significant event that brought the alleged existence of Nessie to the attention of an entranced media, both nationally and internationally. Leslie Holmes (1934). 'I'm the Monster of Loch Ness'. 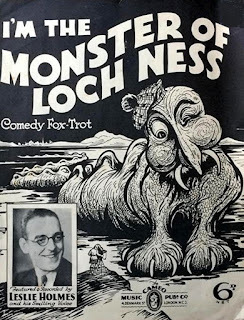 Perhaps the most popular of these early 1930s Nessie recordings is this delightful ditty, a comedy foxtrot written and composed by Ralph Butler and Will E. Haines, and most famously sung by British variety star Leslie 'the smiling vocalist' Holmes. Recorded by him on 6 January 1934 as a 78 rpm shellac record on London's Regal Zonophone label (with sheet music published by Cameo Music), it also featured the Midnight Minstrels, plus Scott Wood and His Orchestra. Holmes was also filmed singing it, in b/w, by London's British Pathé Studio, in an amusing sketch that included an appearance by Nessie herself at its close. Recorded on 25 January 1934, this sketch can be viewed here on YouTube. In 2014, M. Ryan Taylor brought out a book of spooky songs entitled The Haunted Ukelele, which included 'I'm the Monster of Loch Ness'. Here is a recording of him singing it while playing a Koa model Godin Multiuke. My sincere thanks to Facebook friend Joe Mancini for first alerting me to the Leslie Holmes version of this song. Brian Lawrance (1934). 'Boo, Boo. Here Comes the Loch Ness Monster'. This song is much more obscure than the previous one, despite featuring the well-regarded British vocalist and band leader Brian Lawrance on its best known version, which again was recorded in January 1934 as a 78 rpm record, but this time by the Eclipse label. As yet, I have been unable to trace an online version of it. John Tilley (1933). 'The Loch Ness Monster'. Not a song as such but what was back then a very famous comedy monologue for radio, spoken by John Tilley, a briefly popular, quintessentially English broadcaster/revue artist during the early 1930s, who recorded it as a 78 rpm record in December 1933 for the Columbia label. Tragically, Tilley was only in his late 30s when he died in 1935. You can listen to it here. After those early recordings, a fair few years went by before Nessie received much in the way of further musical mileage, but from the 1960s (and especially the 1970s) onwards, she has been a perennially popular subject for songs and melody, as the following diverse selection demonstrates. Robin Hall & Jimmie MacGregor (1961). 'The Monster of Loch Ness'. This Scottish folk duo formed in 1960 and recorded over 20 albums together before their partnership ended in 1981. 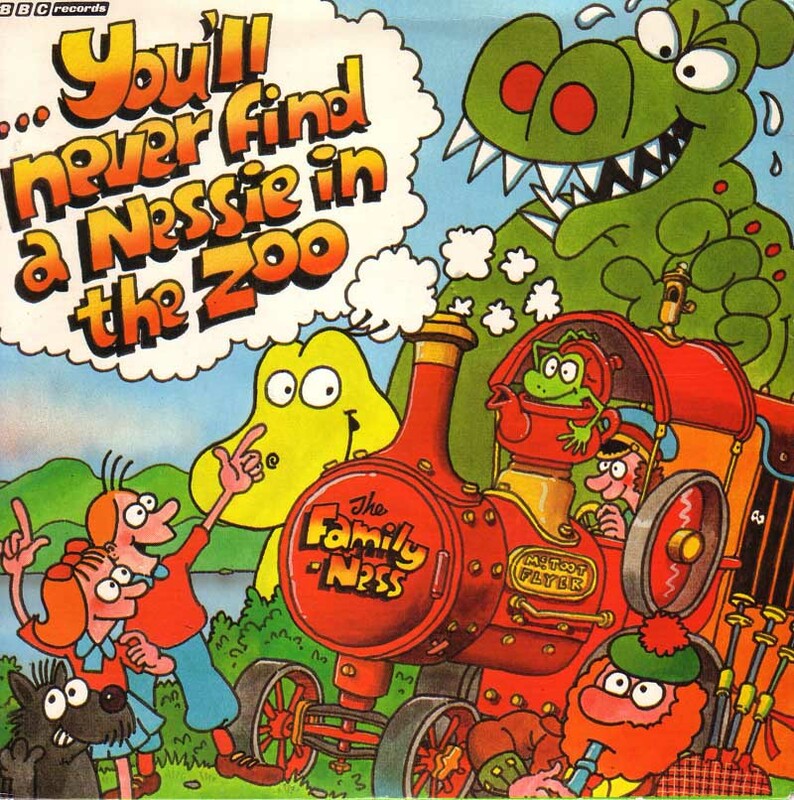 Their humorous Nessie song was co-written by MacGregor, was released as a 45 rpm vinyl single in 1961 on the Decca label, and can be listened to here. King Horror (1969). 'Loch Ness Monster'. This highly-collectible 1969 single by skinhead reggae act King Horror (originally a calypso singer, apparently) and issued on the Grape label is (in)famous for the OTT bloodcurdling screams at the onset (listen to it here). Somehow, I don't think that his Nessie is the shy, retiring, piscivorous type! Alex Harvey (1977). 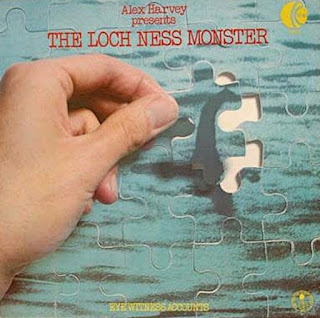 'Alex Harvey Presents: The Loch Ness Monster'. 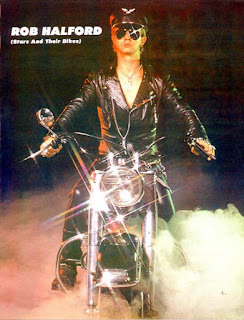 Best known as the founder and frontman of the Sensational Alex Harvey Band (SAHB), Scottish rocker Alex Harvey also recorded this 40-minute spoken documentary solo LP album, released in 1977. Harvey had previously spent the summer at Invermoriston in the Scottish Highlands by himself while the rest of his band were doing other things, and had interviewed a range of LNM eyewitnesses and historians, recording their narratives and interspersing them with views of his own and also additional commentary by Richard O'Brien of The Rocky Horror Show and The Crystal Maze fame. Released as a limited edition album by the K-Tel label and complete with an illustrated 16-page diary-format booklet in a gatefold sleeve, allegedly only around 300 copies were actually pressed, thus making it highly sought-after. It only contains one (very short) song, right at the end of the LP, entitled 'I Like Monsters Too', which can be listened to here. The Sensational Alex Harvey Band (1978). 'Water Beastie'. The SAHB with Harvey fronting also recorded a Nessie song, 'Water Beastie', which appeared as track #8 on their 1978 album 'Road Drill', and was co-written by Harvey, Chris Glen, and Hugh McKenna, all from SAHB. Listen to it here. The Police (1983). 'Synchronicity II'. Appearing as track #6 on this seminal English rock band's album 'Synchronicity' and also released as a single in 1983, this song tells of two unrelated events that are happening simultaneously – a demeaned, harried husband and father's life descending into increasing depression and despair, while, far away, a monstrous entity emerges from a dark Scottish loch and moves ominously, inexorably, towards a lochside cottage. It was written by the band's lead singer/bassist, Sting, and can be viewed and listened to here. The Family Ness (1983). 'The Family Ness'. This song was played over the opening titles to each episode of The Family Ness. No vocalist screen credit was aired, but it has been suggested that Gavin Greenaway himself may have been the singer, as he was aged approximately 20 at that time, and the singer sounds like someone of around that same age (ditto for the end credits song too – see next song entry). The Family Ness (1983). 'You'll Never Find a Nessie in the Zoo'. An extended, full-length version of this song, hitherto played only in brief, incomplete form over each episode's end credits, appeared in the very last episode of this TV series, and became the video for the song when released as a single. My dear little Mom, Mary Shuker, absolutely adored both the song and the video, and whenever I played it (having taped it on videocassette) she would always stop whatever she was doing and watch it, laughing with delight. Happy days, happy memories. Watch and listen to it here. 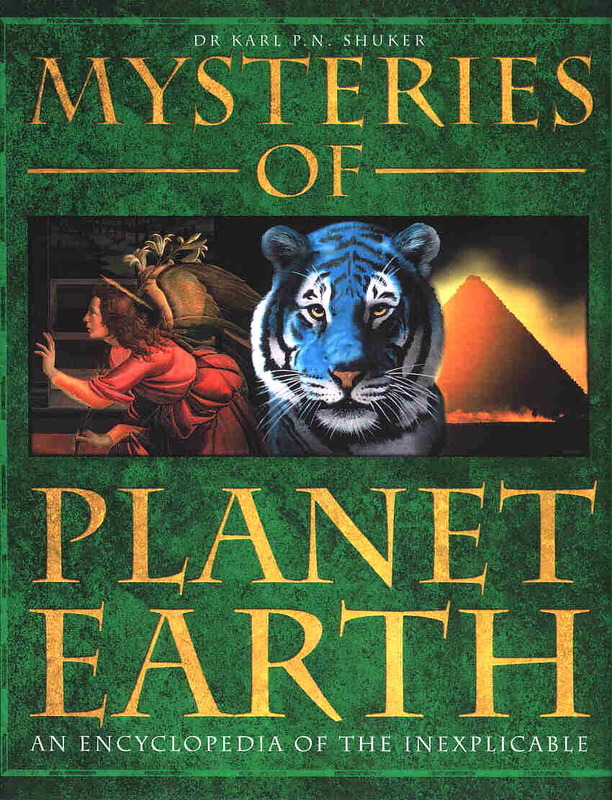 Stuart Anderson (1992). 'Nessie (The Loch Ness Monster)'. Mom was also a big fan of this act. In 1989, at the tender age of six, pint-sized Scottish singer Stuart Anderson's highly-polished performance of 'Bonnie Wee Jeannie McColl' in the annual 'Young Entertainer of the Year' competition staged on BBC1's Saturday morning teenage television show Going Live so entranced the voting public that he ultimately won it by the biggest margin of votes ever recorded in this competition. On the back of his success, Stuart went on to release several albums, one of which, 'Stuart Anderson Acts Naturally', released in 1992, contained the cheery singalong song 'Nessie (The Loch Ness Monster)'. Today, aged 32 and a well-respected guitar teacher, Stuart's very youthful showbiz days are long behind him, but he remains forever young - and forever singing about Nessie (not to mention Bonnie Wee Jeannie McColl!) – here on YouTube. Phyllis Logan (1992). 'Shy Girl'. This song comes from a British animated feature film entitled Freddie as F.R.O.7., which was released in 1992 (and retitled as Freddie the Frog in the USA). A James Bond parody, it tells the somewhat complicated story of Frederic, a medieval prince and heir to his country's throne, who is turned into a frog by his evil aunt Messina (who has already secretly killed his parents in her bid to become ruler), after which he travels through a time zone into the 20th Century, becomes a member of the French Secret Service (F.R.O.7.) 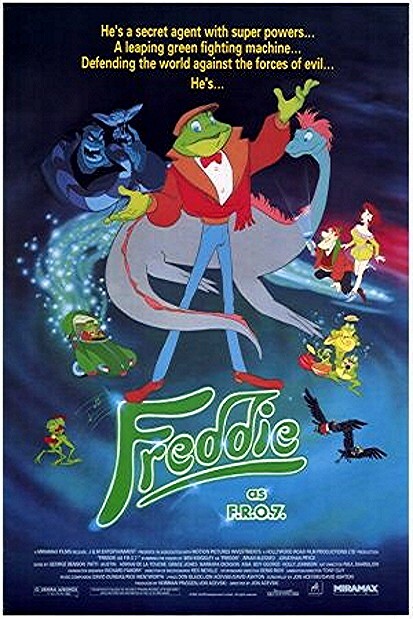 as Freddie the Frog, and is then sent by them to Britain in order to foil a plot by arch-villain El Supremo and Messina to enslave the world's population. 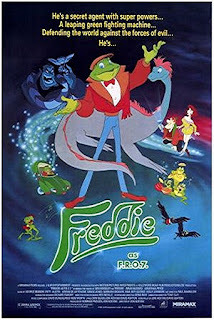 Somewhere in amongst all of this mayhem, Freddie encounters Nessie (voiced by Phyllis Logan) and her many other long-neck relatives in Loch Ness, and she informs him in song (and dance) of what a shy girl she really is. An excerpt from the film that includes this song, and which in my opinion is both the most entertaining and the most beautifully animated section of the entire film, can be viewed here. This is a Dutch folk band but their music is also infused with Celtic, klezmer, and punk elements. Their LNM song, from an early 1990s album, is apparently all about Nessie's, ahem, intimate liaisons with other loch monsters – but I don't speak Dutch, so I wouldn't know... Listen to it here. Some Velvet Sidewalk (1992). 'Loch Ness'. American experimental lo-fi rock band Some Velvet Sidewalk released two different versions of their Nessie-themed song 'Loch Ness' (listen to it here). One version appeared as track #2 on their own 1992 album, 'Avalanche'; the other had appeared a year earlier, again as track #2, but this time on 'Kill Rock Stars', which was a compilation album featuring a number of different acts. Those Darn Accordions (1996). 'Deathbed Confession'. This song from San Francisco accordion band Those Darn Accordions' 1996 album 'No Strings Attached' takes its inspiration from the 'deathbed confession' claim of Christian Spurling in 1993 regarding his supposed (but never confirmed) hoaxing of the famous Surgeon's Photograph, by having allegedly made a head-and-neck model of Nessie, attached it to a toy submarine, and set it afloat on Loch Ness one day in April 1934, where it was then reputedly photographed, yielding the iconic image that gynaecologist and purported co-conspirator Robert Kenneth Wilson then passed off to the media as a genuine Nessie photo. The Real McKenzies (2001). 'Nessie'. This song is the opening track to Canadian Celtic punk band The Real McKenzies' 2001 album 'Loch'd and Loaded', and is basically a protest song regarding the search for and potential future capture of Nessie. This lengthy track (13.28 minutes long) is the tenth and final one on world-famous British heavy metal band Judas Priest's fifteenth studio album, 'Angel of Retribution', and was co-written by their legendary leather-clad frontman, Rob Halford, returning to the band after an absence of 15 years. Listen to it here. Reggie and the Full Effect (2005). 'Get Well Soon'. The video to this song, track #2 from Kansas City rock band Reggie and the Full Effect's 2005 album 'Songs Not To Get Married To', features the collapse and total disintegration of a green, suspiciously arm-puppet-like Loch Ness monster's entire life, beginning with a savage divorce settlement in which he loses his loch and is forced to roam the streets homeless as his life falls apart, reduced to living in cardboard boxes. Unrelentingly dark and grim, there is no happy ending for this video's LNM. Watch it here to see for yourself. In pleasant contrast, the video to this 2006 song, track #5 on Welsh rock band The Automatic's debut album 'Not Accepted Anywhere', is pure slapstick comedy, featuring a Nessie whose vertical neck rising above the loch's surface is of veritable skyscraper proportions yet somehow still manages to go unnoticed by the band, starring here as hapless monster seekers. So too does a dancing bigfoot that definitely gets down and gets with it as their song plays, before things finally hot up in every sense for our heroes when they have an exceedingly close encounter with a UFO. View it here. Adam Faith (1961). 'What a Whopper'. Also well worth including here is this title track to a British b/w comedy film from 1961 entitled What a Whopper, featuring an attempt by a young struggling would-be novelist to raise money by writing a book about the Loch Ness Monster and then, to generate plenty of publicity for it and thus ensure its success, staging a hoaxed Nessie sighting - only for the real Nessie herself to make a surprise, and very tongue-in-cheek, appearance in the closing scene of the film. It starred British rock 'n' roll singer and actor Adam Faith, who also sang the toe-tapping theme song (written by Johnny Worth) that opens the film. View and listen to it here. In addition to those songs documented above, in which Nessie features extensively in the lyrics, there are a fair few others in which she is mentioned briefly or in passing. No less than 57 of these, recorded by the likes of Eminem, Roger Taylor, Pras, De La Soul, and Crash Test Dummies among others, can be accessed here. THE LAKE OKANAGAN MONSTER: Paul Whiteman Orchestra (1924). 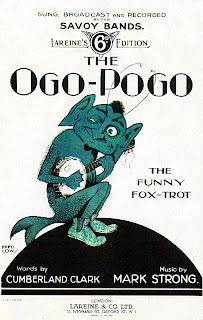 'The Ogo-Pogo – The Funny Fox-Trot'. As every self-respecting cryptozoological enthusiast will readily confirm, this is the English music-hall song from 1924, composed by Mark Strong, that subsequently gave its name to the now-famous water monster of Canada's Lake Okanagan (until then, it had been known only as the naitaka - a traditional Native American name given to it by the local Okanakane nation). Despite the song featuring a banjo-playing terrestrial monster from Hindustan (additionally sporting a pair of antennae and wearing boots in the delightful illustration by Fred Low adorning its sheet music's front cover) - far removed indeed from Canada's unequivocally non-musical aquatic cryptid of serpentiform shape – the name Ogopogo stuck, and the Lake Okanagan monster has been affectionately referred to by it ever since. For further details concerning this song - including how I was fortunate enough to encounter and purchase a copy of the sheet music for the Savoy Havana Band's original version of it from 1924, thereby enabling me to include its front cover illustration for the very first time in a cryptozoological publication (my book In Search of Prehistoric Survivors, 1995) - please click here. Several different acts released this song in 78 rpm record format during the 1920s, including the Paul Whiteman Orchestra in 1925 that featured Billy Murray as vocalist singing reworded American lyrics (which can be listened to here) rather than the original English ones written by Cumberland Clark, the Savoy Havana Band singing the original English lyrics (see illustration above), Meyer Davis' Swanee Syncopaters, and George Berry (aka Harry Fay). THE PATAGONIAN PLESIOSAUR: Arturo Terri (1922). 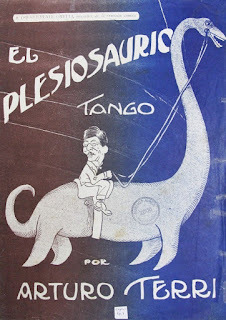 'El Plesiosaurio Tango'. Seemingly as elusive as the lake-dwelling Patagonian long-neck that it celebrates, this exotic-sounding crypto-composition has evaded every attempt not only by me but also by several friends and correspondents on Facebook to track down an online recording of it – but this is only fitting, I suppose, bearing in mind that its subject also succeeded in remaining concealed from those searching for it. With lyrics by Amilcar Morbidelli), it was composed in 1922 by Rafael D'Agostino to commemorate Argentinian biologist Dr Clemente Onelli's expedition during April of that same year to a mountain lake near Esquel in Argentina, seeking the so-called Patagonian plesiosaur that had allegedly been sighted there by an itinerant Texan adventurer called Martin Sheffield who had lived off the land in Patagonia for many years. Sponsored by Buenos Aires Zoo, of which Onelli was the director, the expedition did reach this lake, but no sightings of cryptids were made (further details can be found in my book In Search of Prehistoric Survivors). 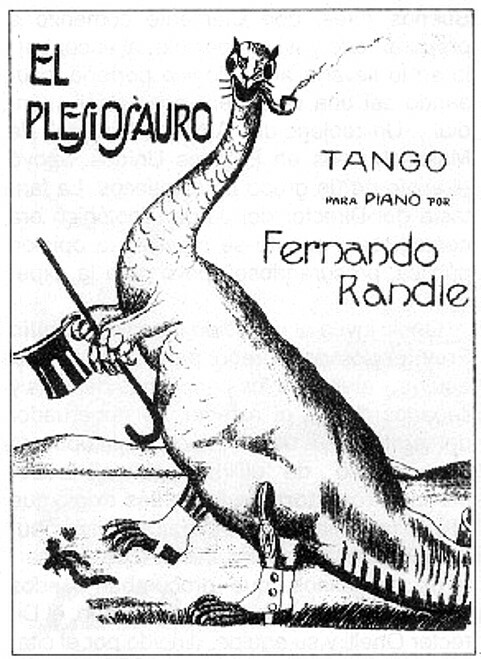 D'Agostino dedicated his plesiosaur tango to Onelli (who died in 1924), a caricature of whom is humorously portrayed riding the plesiosaur on the front cover of the Arturo Terri version of this composition's sheet music. If anyone reading this ShukerNature blog article knows of an online recording of 'El Plesiosaurio', I'd greatly welcome details. Meanwhile, here is a link to its Spanish lyrics. Incidentally, this was not the only 1920s musical composition inspired by Onelli's Patagonian pursuit of plesiosaurs. 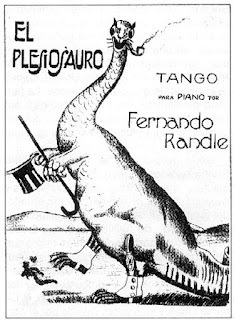 Here is the delightful front cover illustration from Fernando Randle's piano sheet music for his own composition, 'El Plesiosauro Tango' (note the slight difference in its title's spelling from that of D'Agostino's tango), featuring a very dapper pipe-smoking plesiosaur with top hat, spats, and cane! Sadly, however, Randle's plesiosaur tango was not as popular as D'Agostino's. Once again, I haven't been able to locate an online recording of it, so I'd greatly appreciate any assistance in doing so. 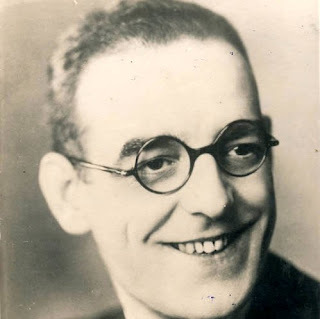 Julio Fava Pollero's 'Antediluvian Tango' was a third tango inspired by Onelli's plesiosaur hunt, but although he performed with his own orchestra he never released this composition in record form, only as sheet music, published in 1927. This was because by then the swell of public interest in the Patagonian plesiosaur expedition had subsided. Its sheet music's front cover depicted a humorous caricature of Onelli attempting to tie the plesiosaur down. My sincere thanks to several Facebook friends, especially Karl J. Claridge, Claudio Diaz, Adam Naworal, Jeff Rausch, and Valerie Wyllie, for supplying me with information and images relating to this trio of Patagonian plesiosaur tangos. THE GREAT SEA SERPENT: Maurice Strakosch (1850). 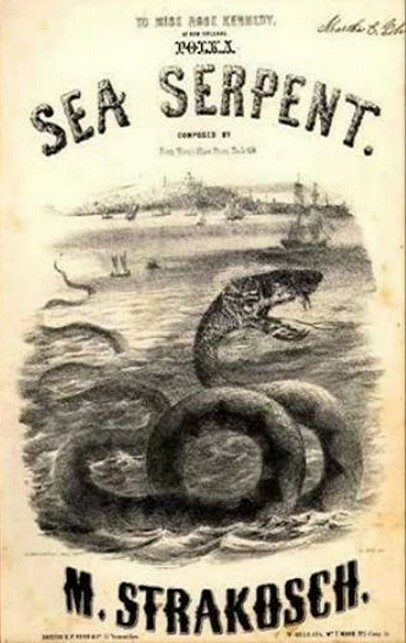 'Sea Serpent Polka'. Inspired by a bout of sea serpent sightings off the towns of Gloucester and Nahant in Massachusetts, New England, USA, during 1817-1819, this very jaunty polka was written in 1850 by Maurice Strakosch, an American musician of Czech origin, and featured an immense snake-like sea serpent coiled upon the front cover of its sheet music. An undated recording of concertina player Michel Van Der Meiren performing this lively tune can be listened to here on YouTube. Many thanks indeed to Facebook friend Jeff Meuse for bringing this charming instrumental composition to my attention. I do hope that you've enjoyed this very special Nessie concert here on ShukerNature. If so, then that is definitely music to my ears! 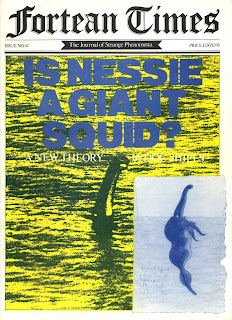 This ShukerNature blog article is excerpted from my book Here's Nessie! A Monstrous Compendium From Loch Ness – coming soon! A still-unexplained yet little-known wildlife-related phenomenon is the extraordinary occurrence, discussed by several naturalists during the 19th Century, of sparks and flame-like flashes of light unexpectedly emitted by certain plants. 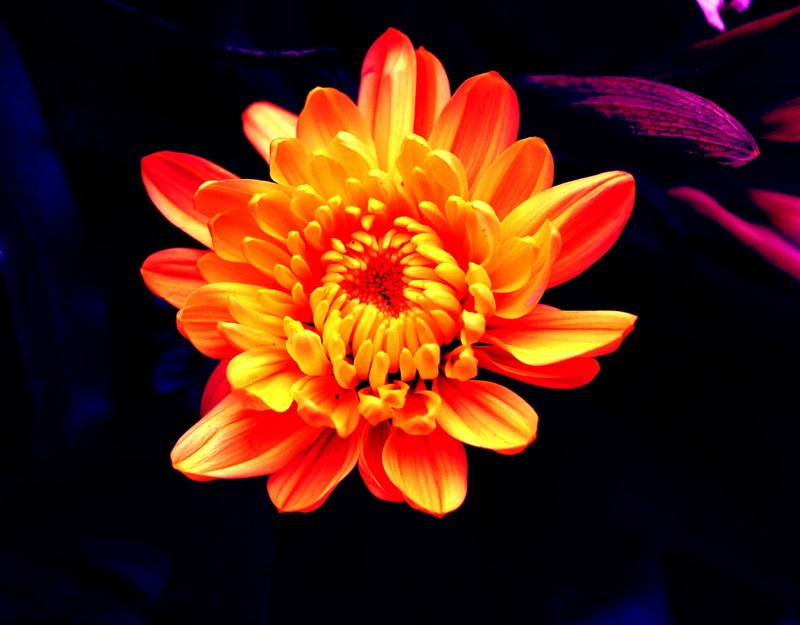 Those most commonly associated with this bizarre enigma are species such as marigolds and geraniums, which possess red, orange, or yellow flowers. This circumstance was noticed on the 4th of August, 1842, at eight p.m., after a week of very dry warm weather; four persons observed the phaenomenon [sic]; by shading off the declining daylight, a gold-coloured lambent light appeared to play from petal to petal of the flower, so as to make a more or less interrupted corona round its disk. It seemed as if this emanation grew less vivid as the light declined; it was not examined in darkness, which omission will be supplied on a future occasion. It may be here added, in the view to facilitate any other observer who may give attention to this phaenomenon, that the double marigold is the best flower to experiment on, as the single flower "goeth to sleep with the sun," and has not the disk exposed for investigation. In living vegetables emissions of light have been observed in a dozen phaenogamous plants and in some fifteen cryptogamous ones. The phosphorescence of the flowers of Pyrethrum [Chrysanthemum] inodorum, Polyanthes [sic - Polianthes] (tuberose), and the Pandani has been known for a long time. Haggren and Crome were the first to discover such luminous emanations from the Indian cross and marigold, and a few years ago I myself was permitted to observe, during a summer storm, a phosphorescent light emitted from the flowers of a nasturtium (Tropoeolum [sic - Tropaeolum] majus) cultivated in a garden at Sarthe. 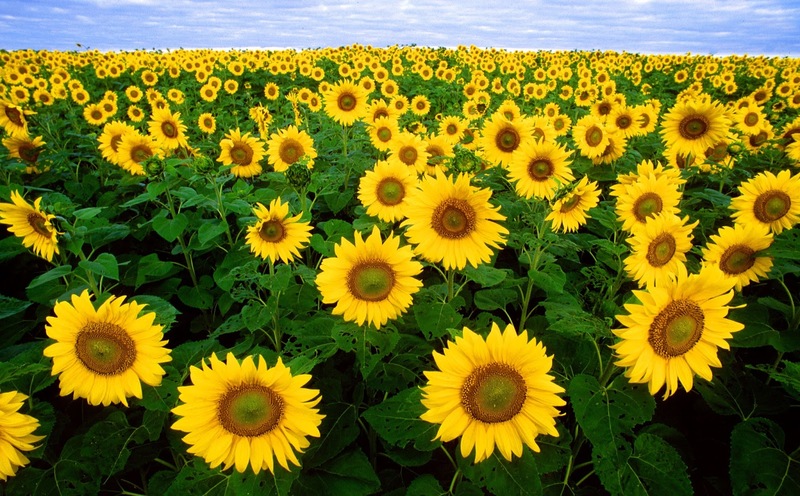 Several reports concerning light-emitting flowers appeared during the 1880s in the English periodical Knowledge. These revealed that one early eyewitness had been none other than the daughter of Carolus Linnaeus, the father of modern botanical and zoological classification, who witnessed this phenomenon while gazing at some garden flowers one summer twilight in 1762. A short time ago, I was picking out some annuals on a flower-bed, on which some geraniums were already planted, when I was surprised to see flashes of light coming from a truss of geranium flowers. At first I thought it was imagination, but my wife and a friend who were present also saw them. Time was about 9 p.m., and the atmosphere clear. There were other geraniums of a different colour on the same bed, but there was no effect on them. The particular geranium was a Tom Thumb. Is this at all common? I have never seen or read of it before. To the same source - electricity - we probably owe the light which, at certain seasons, and at certain times of the day, issues from a number of yellow or orange-coloured flowers, such as the marigold, the sunflower, and the orange-lily...similar phenomena have been witnessed by several naturalists. 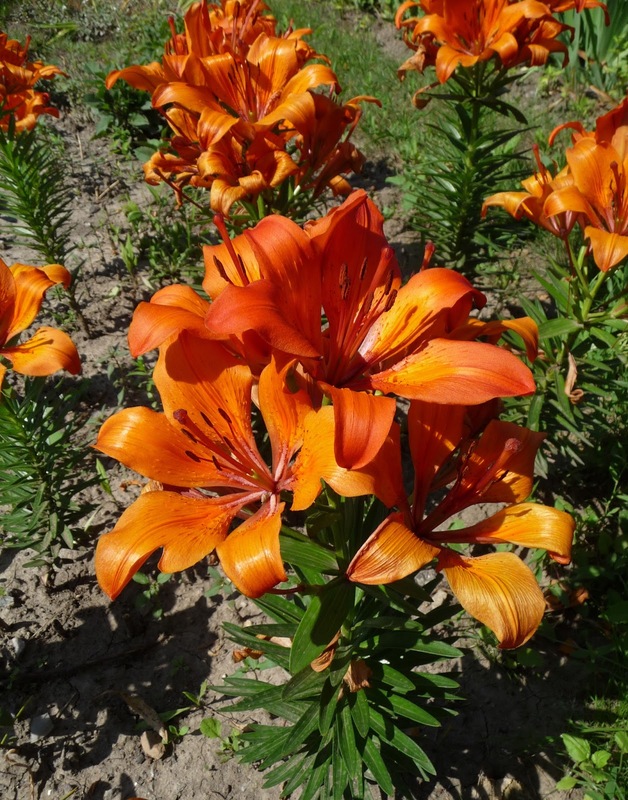 Flashes, more or less brilliant, have been seen to dart in rapid succession from the same flower. At other times the tiny flame-jets have followed one another at intervals of several minutes. 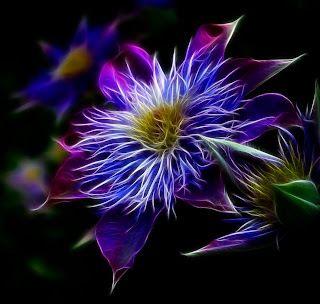 Flowers releasing visible discharges of electricity is undeniably a somewhat dramatic concept. 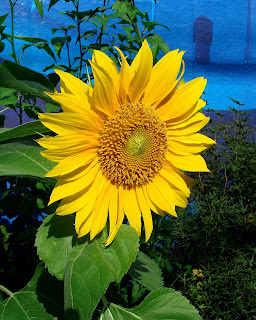 A less radical alternative, perhaps, is that this curious optical effect may be caused by the reflection of sunlight by petals of certain colours acting as miniature mirrors (thus explaining why the effect lessens as daylight declines). 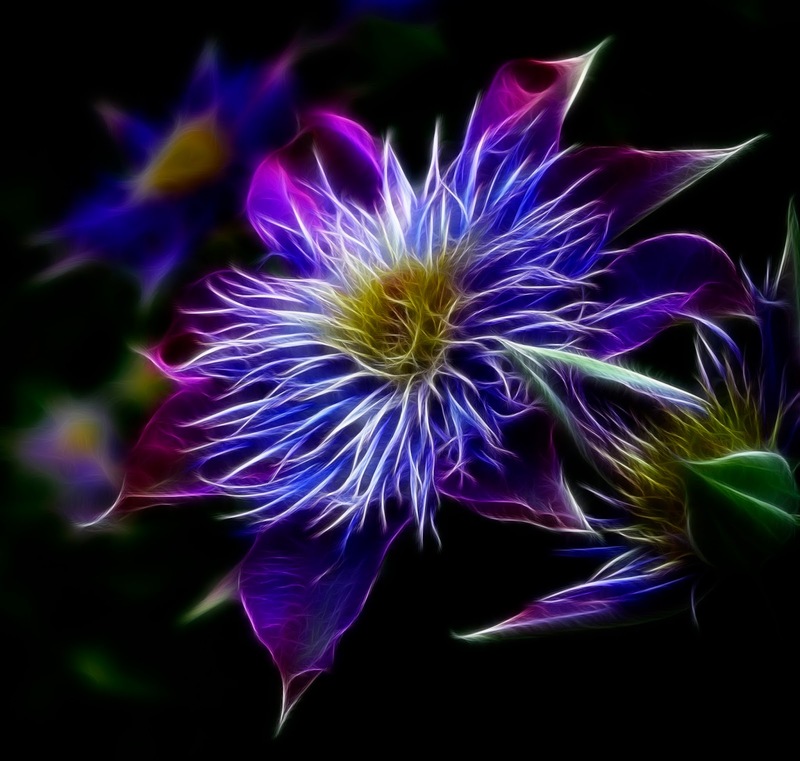 Whatever the answer, however, it is certainly true today that light-emitting flowers have become one of the forgotten phenomena of botany, ignored - if indeed even known about - by contemporary researchers. Yet they were once known, and witnessed, by naturalists. Surely, therefore, it is time for a new generation to rediscover these excluded enigmas, and extract their long-hidden secrets. After all, as succinctly pointed out by the late, much-missed fortean writer Mark Chorvinsky regarding this mystifying subject: "There are a lot of marigolds and geraniums out there". 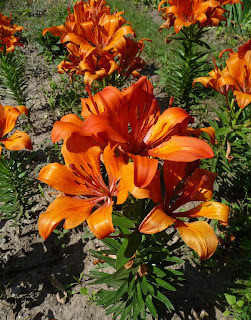 So if anyone reading this ShukerNature blog article has ever witnessed light-emitting flowers, I'd be very interested to receive details if you'd like to post them here. 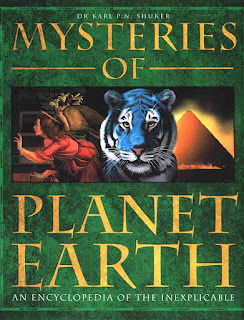 This ShukerNature blog article was excerpted from my book Mysteries of Planet Earth. Named after their very distinctive body tattoos, the Picts ('painted people') inhabited northeastern Scotland as a separate tribe from c.300 AD to 850 AD, after which they were united with the Celtic Scots under the reign of King Kenneth I. The Picts can boast as their principal claim to archaeological fame their ornately-carved symbol stones. These are elaborately decorated with various creatures, objects, and other depictions, especially the earlier, pre-Christian stones - which are designated as Class I (dating from the 6th Century, generally unshaped, and bearing line-incised symbols on at least one flat face) or Class II (of rather later date, and bearing much more intricate, flamboyant designs). Class III stones, conversely, date from when Christianity reached the Picts, so on these stones the earlier Pictish symbols have been mostly replaced by Christian ones. 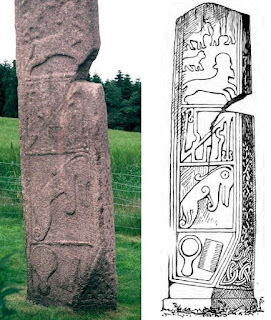 Due to their realistic designs, the many different animal types carved on Class I and II Pictish symbol stones are readily identifiable – with one notable exception, that is. Appearing on about 29 Class I stones and 22 Class II stones, this bizarre-looking exception is known as the Pictish beast. 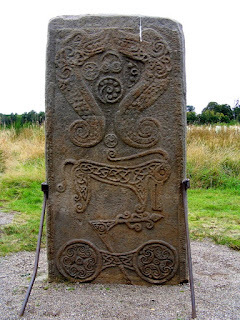 Several very famous Pictish symbol stones bear depictions of it. These include: the Dunfallandy Stone (Class II) in Tayside; one of the Rhynie Pict stones in Aberdeenshire; and the 6-ft-tall Rodney's Stone (Class II), which is a cross-slab of grey sandstone originally present in the graveyard of the old church of Dyke and Moy but subsequently transferred to the Grampian village of Dyke to commemorate Admiral Rodney's victory and standing today on the left side of the avenue leading to Brodie Castle. Other symbol stones depicting the Pictish Beast are a cross-slab on the Brough of Birsay at the northwestern corner of Mainland, Orkney; the 9th-Century, 10-ft-tall Maiden Stone near Pitcaple in Aberdeenshire; and a carved stone in Grampian's Port Elphinstone Henge near Inverurie (the henge itself is much older than the carvings). Perhaps the least stylised, most 'natural' portrayal of this mystifying creature can be found upon a spectacular Class II stone at Tayside's Meigle Sculptures Stone Museum, which is adorned with carvings of horse riders and a tail-biting serpent as well as the Pictish beast, plus the customary Pictish V-rod and crescent symbols. Depictions of it on such symbol stones as these portray this bizarre creature with a dolphin-like head, a long beak, four limbs that often curl backwards underneath its body (although sometimes, as on the Meigle Museum stone, only the paws curl backwards), an elongate tail with a noticeable curl at its tip, and, most distinctive of all, what may be a long slender horn or even a trunk-like projection sprouting from the top of its head and curving over its back. Indeed, this last-mentioned feature has earned the Pictish beast the alternative name of 'swimming elephant' (which all too readily conjures up some decidedly surreal images of a Celtic version of Trunko! - click here to read all about this latter onetime monster of misidentification). Needless to say, no known species of animal resembles the Pictish beast as so portrayed, which in turn has incited appreciable speculation and controversy among historians and archaeologists as to what it may be. One popular, conservative identity for it is a dolphin (or even a beaked whale, i.e. 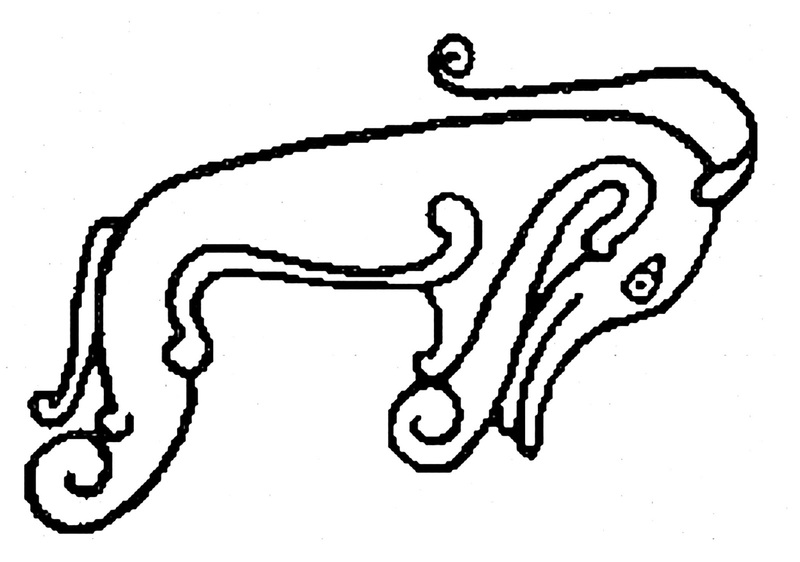 a ziphiid), based upon its beaked, superficially dolphin-like head - as a result of which I wonder if its anomalous 'trunk' may in reality be a representation of a spout of water spurting upwards when the dolphin exhales through its blowhole (conjoined, modified nostrils), which is indeed situated on the top of this marine mammal's head. 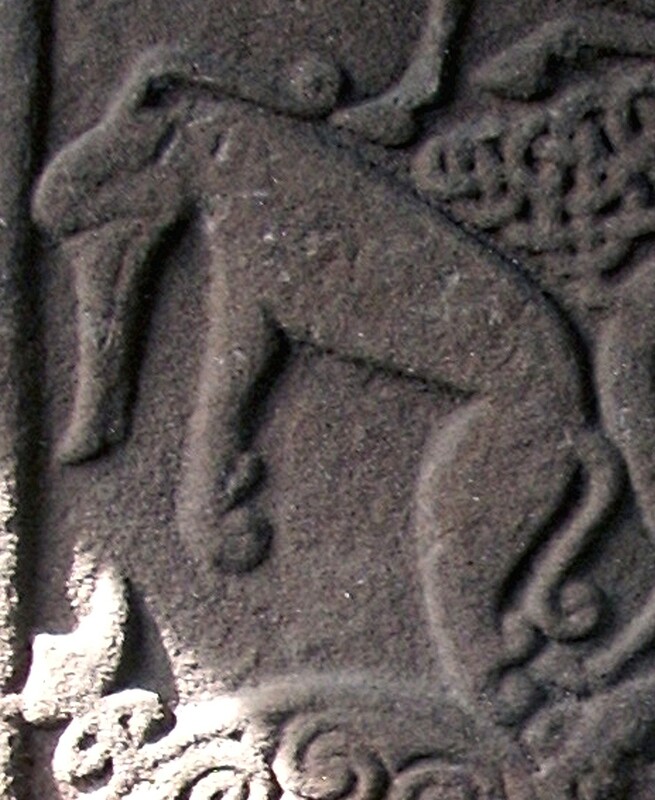 Conversely, the unequivocally leg-like limbs and non-fluked tail of the Pictish beast are radically different from the flippers and fluked tail of dolphins and other cetaceans. Other postulated suggestions include a seahorse (especially when depicted vertically), a deer, a seal, and a dragon. A bona fide elephant or even an unknown species of secondarily aquatic elephant has also been considered (albeit not seriously, for obvious reasons!). 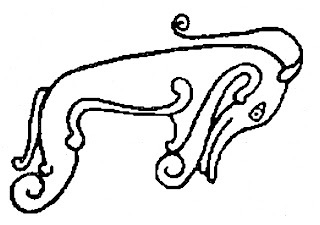 It may simply be that the Pictish beast is an entirely fictitious, imaginary creature, possibly even a composite of several different creatures, but its numerous portrayals (accounting for approximately 40 per cent of all Pictish depictions of animals) imply that it had considerable symbolic significance for the Picts. 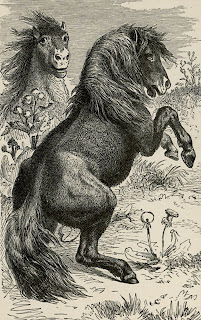 Indeed, it may even be the earliest known artistic representation of the legendary kelpie or Scottish water-horse (click here for a ShukerNature article on this malevolent entity). 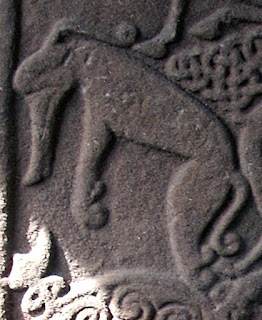 One of the three Aberlemno symbol stones in Tayside depicts a pair of interlaced horse-headed, elongate aquatic monsters, and some scholars have suggested that these may constitute a more sophisticated version of the Pictish beast. "Since a whole range of animals and birds is accurately depicted on the symbol stones - wolf, bull, cow, stag, horse, eagle, goose - perhaps these were the creatures most familiar to the Picts in their everyday world, and 'monsters' were also familiar to them, being more often seen in the lakes than they are today, and accepted as part of the natural world just like eagles and stags." This in turn leads to the most intriguing and original (if zoologically offbeat) identity ever put forward for the Pictish beast. 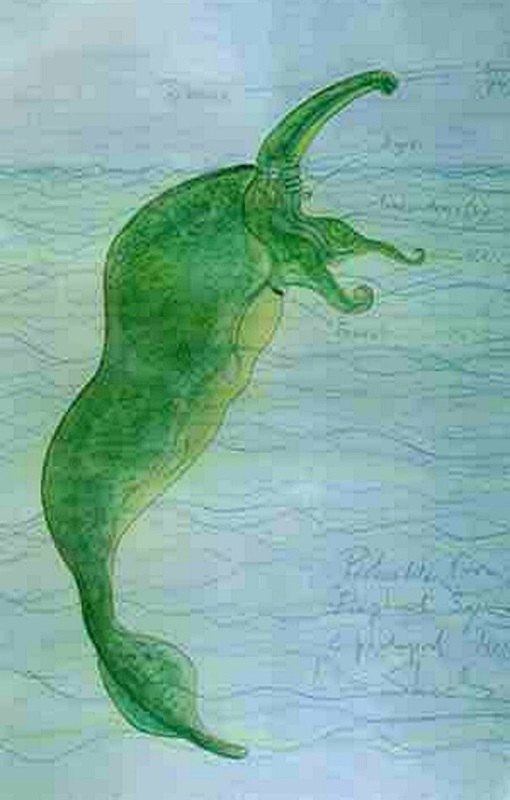 A familiar figure in the British Fortean community for many years, Tony 'Doc' Shiels describes himself as a monster-hunter, stage magician, surrealist artist, and shaman of the western world (among other things), and he has suggested that the Pictish beast may indeed be a depiction of the unidentified Scottish water monsters. Moreover, as he first documented in a Fortean Times article (autumn 1984) and further propounded six years later in his book Monstrum! A Wizard's Tale (1990), and as I have also referred to briefly earlier in this present book (see Chapter 7), he has speculated that these latter mystery beasts' zoological identity could in turn be a highly novel, specialised form of squid. "As conceived by Shiels, the most striking feature of his hypothetical species is a long, flexible, prey-capturing proboscis-like structure (the trunk of the Pictish beast), on account of which he has dubbed this creature the elephant squid. If held out of the water, its proboscis could resemble a long neck, which Shiels believes may explain the familiar 'long-neck' images of Nessie and her kin. He also provides his elephant squid with inflatable dorsal airsacs as part of its buoyancy mechanism (which could yield the varying shape and number of humps reported for Nessie), six short tentacles, and a pair of longer curling arms (the Pictish beast's curling front legs), as well as a muscular tail bearing two horizontal lobes. "In his accounts, Shiels proposes that this remarkable mollusc may even be able to emerge briefly onto land, which might therefore explain why certain Nessie eyewitnesses (such as the Spicers, who claimed to have spied this mystery beast on land in 1933) have likened it to an enormous, hideous snail. Quite apart from the profound morphological modifications necessary for a beast corresponding to Shiels's elephant squid to have evolved from known cephalopod (squid and octopus) stock, however, a fundamental obstacle to this hypothetical creature's plausibility is that all known species of modern-day cephalopod are exclusively marine. There is not a single species of freshwater squid or octopus on record, and for one to evolve would require drastic tissue modifications relating to osmoregulatory ability." 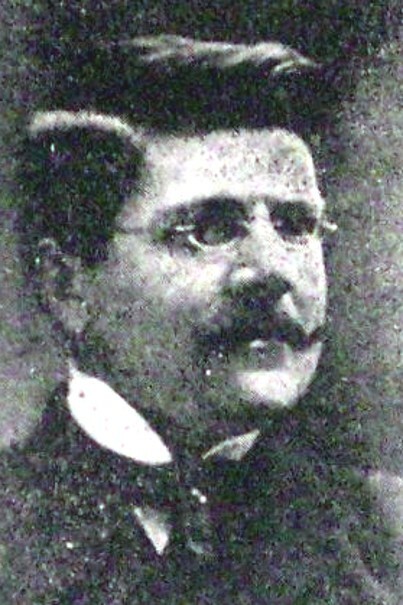 Shiels's Fortean Times account attracted considerable interest within and beyond the Fortean and cryptozoological fraternity, and summaries of his speculation subsequently appeared in a wide range of publications by other writers. Regrettably, however, many of these second-hand accounts mistakenly claimed that Shiels had formally dubbed his hypothetical elephant squid Dinoteuthis proboscideus (translating, incidentally, as 'trunked terrible squid'). In reality, conversely, as Shiels went on to explain in Monstrum!, Irish zoologist A.G. More had already given that particular name to a massive squid specimen beached at Dingle in County Kerry, Ireland, in October 1673 during a major storm. Instead, Shiels suggested that an apt name for his own, totally conjectural cephalopod would be Elephanteuthis nnidnidi - a name that needs no explanation for anyone knowing of Shiels's experiments with psychic automatism. 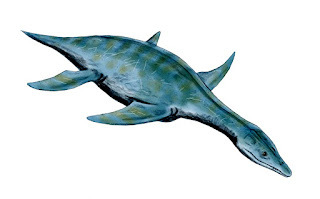 More recently, mystery beast researcher Scott Mardis from the USA has suggested that the Pictish beast images may actually depict an evolved, surviving species of short-necked plesiosaur (and therefore quite probably a pliosaur, which also had long jaws like those of the Pictish beast). Plesiosaurs have of course been officially extinct for at least 64 million years, but an evolved, surviving representative of the long-necked, short-jawed version (elasmosaur) of these aquatic prehistoric reptiles nevertheless has long been a popular cryptozoological identity for Nessie-type water monsters. In short, the Pictish beast remains the subject of several interesting interpretations, but no satisfactory solutions - unless of course the answer lurks not among its petroglyphic portrayals but instead within the secretive depths of the lochs forming a major, familiar part of the landscape once inhabited by the painted people of Scotland's distant past? 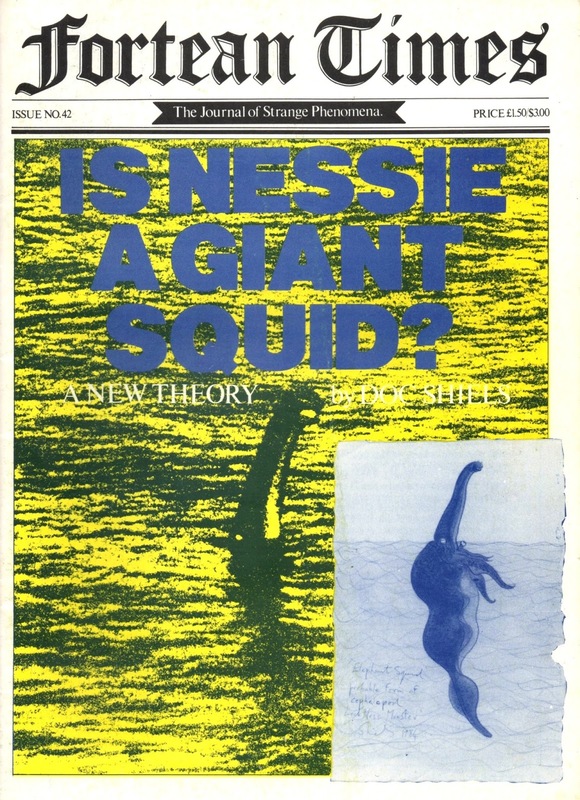 This ShukerNature blog article is excerpted from my forthcoming book Here's Nessie! A Monstrous Compendium From Loch Ness.